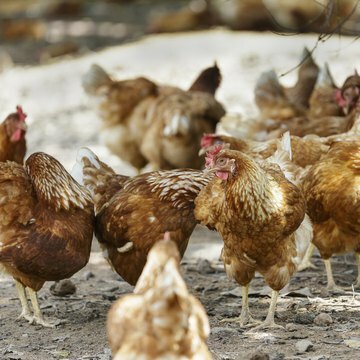 What Is the Age of a Pullet Chicken? Female chickens are known by a variety of names that correspond to their life stages, "pullet" being just one of them. What's in the name is important, as chickens' nutritional needs change at each stage of life. Providing the correct nutrition at each life stage is vital for proper bone development, good health and egg-laying potential. Generally speaking, chickens are called chicks for six to eight weeks -- from the time they hatch to the time they develop the characteristics that make them obviously males or females. Then the young females are called pullets, the young males called cockerels. Farm suppliers, meanwhile, call female chicks of laying breeds pullets even before they've developed, to differentiate them from male or meat chickens. Around 6 months of age, these pullets will begin laying small eggs known as pullet eggs irregularly for a few months. By the time they're a year old, they're full-fledged hens. Chicks eat chick mash or crumble and need supplemental heat until their pullet feathers grow in. Switch them to pullet mash to ensure they get optimal nutrition needed to develop strong bones and a healthy reproductive system for laying eggs. Pullets will need layer mash to obtain the proper calcium to produce pullet eggs. Improper nutrition at this point can lead to egg binding and other potentially fatal problems when the pullets mature into hens. Do Laying Hens Have Wattles? What Is the Target Weight for Laying Hens?